A few days before I needed to send off “the” Christmas package to my family out west, I decided that I needed to throw just “one more” gift in there. Normally I have quite a nice time planning out projects to sew for my nieces and nephews but this year I had not planned on sending them any handmade items. Partially because I was stumped, and partially because I didn’t have a sewing room (my stuff was all over the hallway and in the process of being moved). As I was moving my fabric I stumbled over a mini charm pack of Vanessa’s new fabric, Color Theory that I picked up at Quilt Market in October. 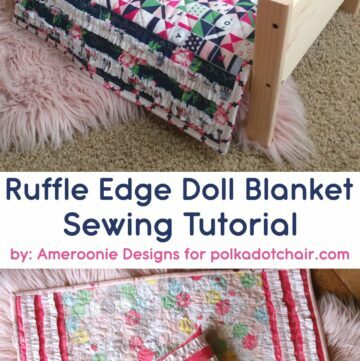 I noticed how nicely the colors coordinated with my new Derby Style line of fabric and thought it would be fun to whip a very quick doll quilt to go with the doll we had purchased for my niece for Christmas. We had bought her a Lalaloopsy doll and I loved how the bright colors of the doll coordinated with the fabric. I wish I had taken a photo with the doll and the quilt, but it wasn’t a good idea in my opinion to “unbox” a Christmas present before it was given… even for a blog photo *wink*. 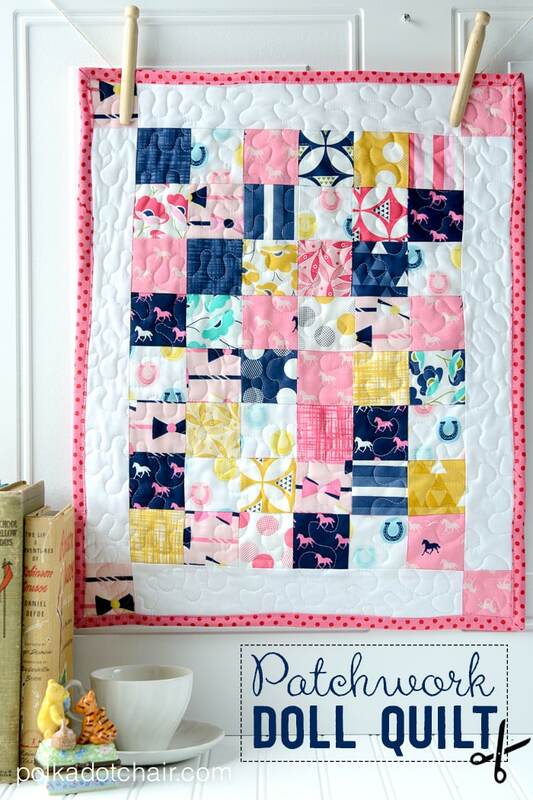 This quilt is a quick sew and would be a great project for a beginner or teen sewist. You can whip one up quickly if you buy a mini charm pack but you can also cut out squares just as fast. 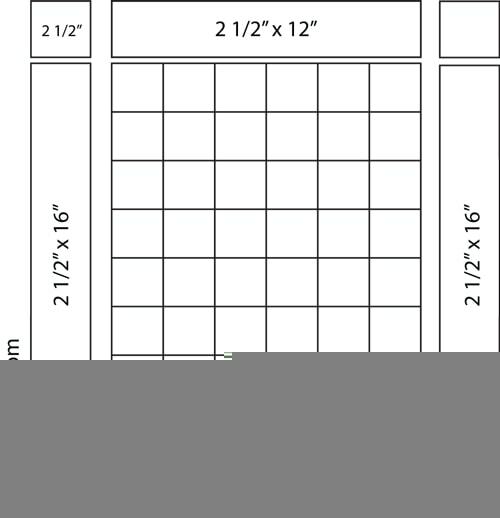 52 – 2 1/2″ squares of fabric in various prints. (4 of these squares are for the corners of the quilt). 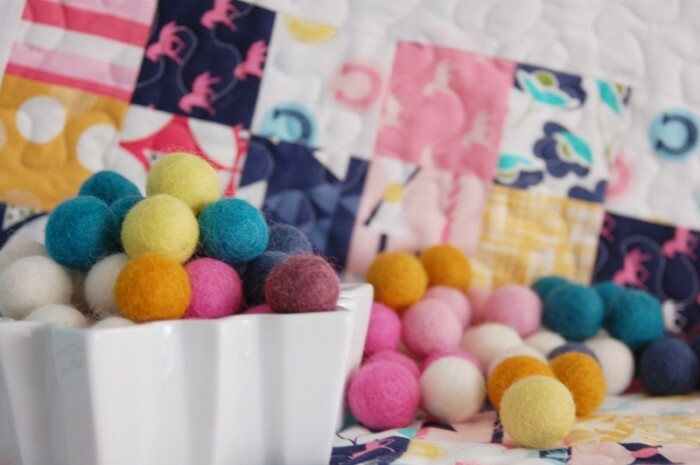 You can buy a mini charm pack or a cut them from a variety of fat quarters. I wouldn’t buy yardage for this project, you’d end up with too much waste. You can also use some of your scrap pile. 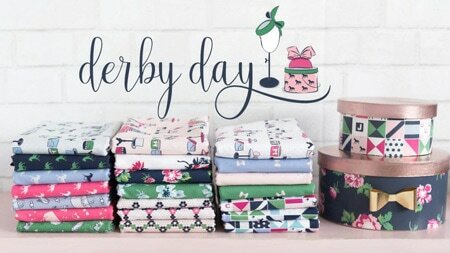 Fabrics in the quilt above are from Derby Style by Melissa Mortenson for Riley Blake Designs and Color Theory from V & Co for Moda Fabrics, both due in stores sometime this month. Begin by arranging your squares in a pattern that you like. You need 6 squares across by 8 squares down. Taking care to balance out the various colors and lights and darks across the quilt top. Sew together in rows of 6. Press the seams to one side. Alternating which direction you press your seams by row. For example press the seams of the even rows towards the right and the odd rows towards the left. Next sew all 8 rows of six together. Press seams to one side. To assemble the remainder of the quilt. Stitch one 2 1/2″ square to each side of the two 2 1/2″ x 16″ pieces. Press seams to one side. Set aside. 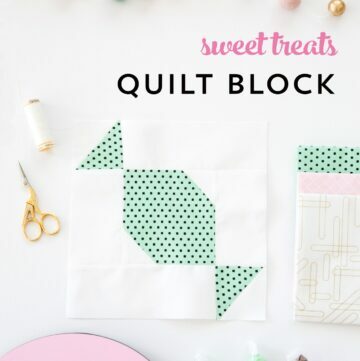 Stitch a 2 1/2″ x 12″ piece of fabric to the top and bottom of the sewn squares. Press. 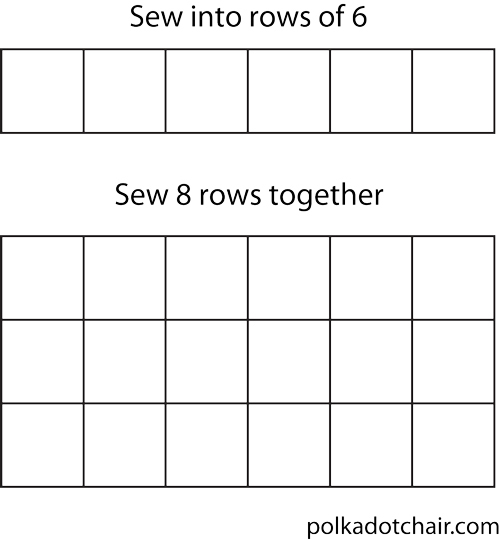 Stitch the 2 1/2″ x 16″ pieces with 2 1/2″ squares sewn on, to the two sides of the quilt top. Press. Quilt as desired. 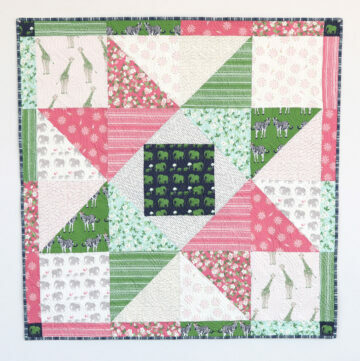 If you’d like a simple tutorial for doing this you can see my Machine Quilting Basics Sewing Lesson. Bind. 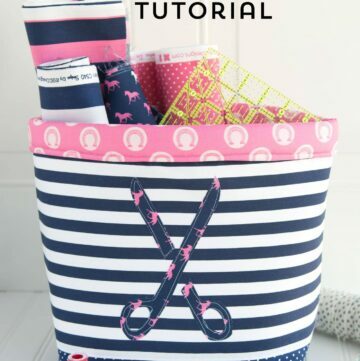 For a great binding tutorial try this one. 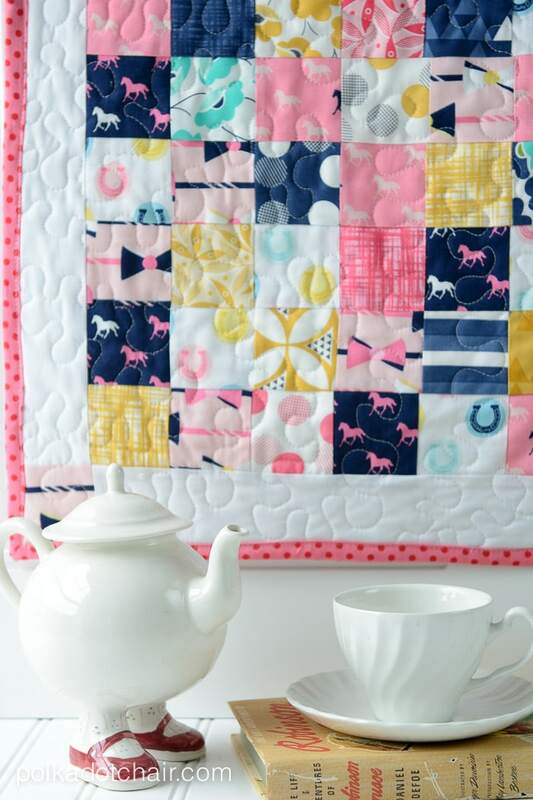 You can easily stitch up a few quilts in an afternoon as gifts for your favorite toddler or little girl! If you liked this project, you may also enjoy the projects in my book! 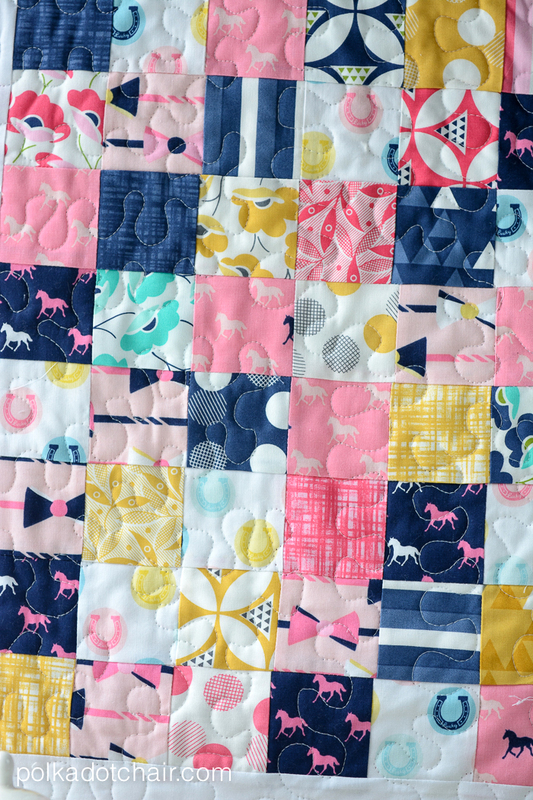 The quilt is adorable and you are right, the two fabric lines go very well together. Bet your niece was really happy with her gifts! 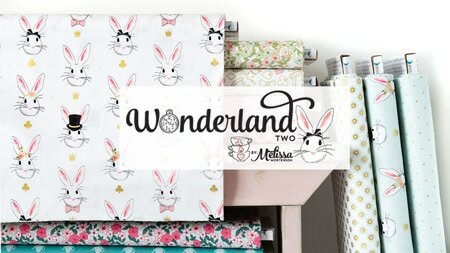 Hi Melissa, I am 41 years old and have always been in love with fabric but never have ever used a sewing machine. 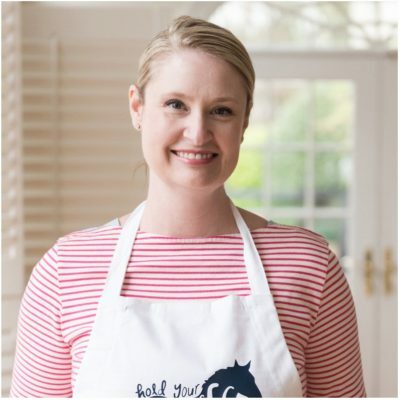 I’ve finally decided it’s time to see if this “old dog can be taught a new trick:)” I really want to learn and your blog and book has really inspired me and I absolutely love your fabric line and all of your projects. So I wanted to ask, do you have any suggestions for a beginner on what sewing machine would be good for someone just starting out? 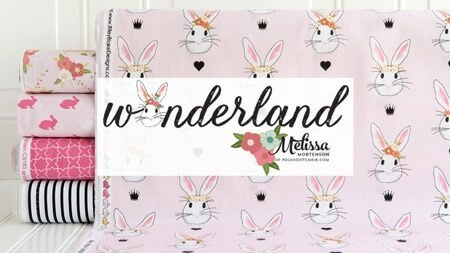 Also…..I love this baby blanket…my 7 year old daughter wants this for her bitty baby doll:) The fabrics look great together…And my daughter loves your fabric line as well. She wants to learn to sew as well so this is a mother/daughter goal for us to learn together:) Thank you! Hi Heather! 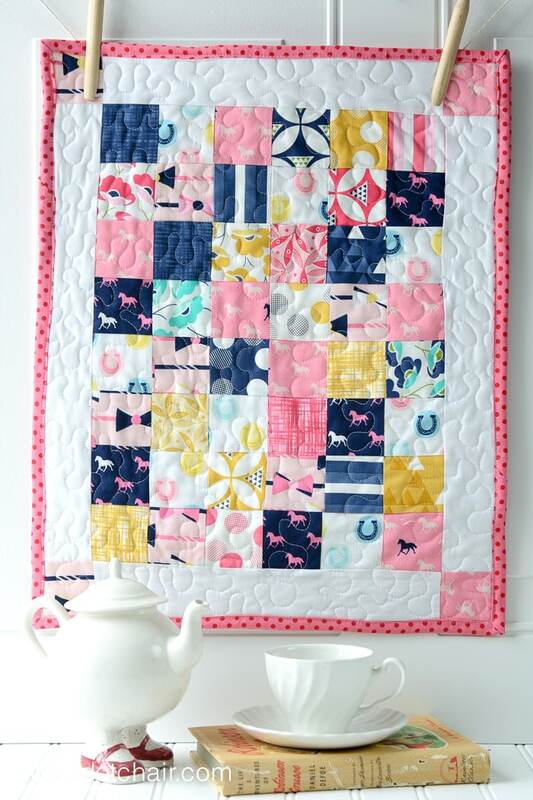 It’s never too late to learn to sew! As for a sewing machine recommendation: I would recommend that you find a local sewing shop that sells machines. You can ask them a million questions about the machines and they are there to help you after you buy the machine. Many also offer free new owner classes, which would be a big help to someone just starting out. Most shops have machines of all different price ranges, including some for beginners. 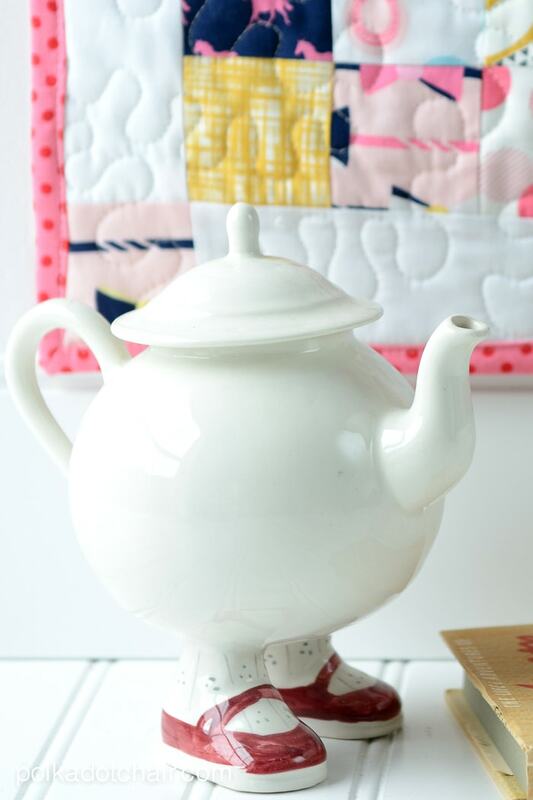 LOVE the teapot! I have two cups that go with it. Oh I’m so glad that you like it!!! I love that Ruby Lou bag too- It’s on my list of things to make again! 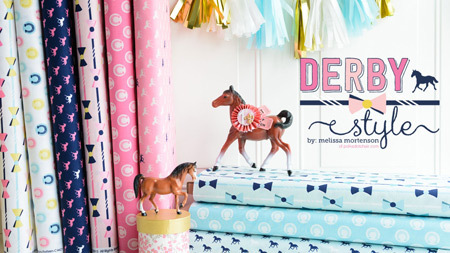 Just to let you know, the sashing should be cut at 16 1/2 and 12 1/2 inches long, not 16 and 12. This is because the pieced middle hasn’t had its outside seem allowances used up before you attach the sashing.